It turned out to be a lot. Conflicting schedules, no-shows, missing contact info, a corrupt Excel file, competition over who gets to do what (I once had to break up a fight over who would fry the bacon)... the list goes on. These issues led me to search for software that could help. Given my budget was $0, I was delighted to find a number of free volunteer management tools that offered simple shift scheduling, automated email reminders, easy online registration, and tools to help me match jobs to volunteer skills. A quick evaluation of the tools I found led me to the perfect one for my needs, which has solved my problems ever since. To help others like me, I’ve put together this list of every volunteer management tool I've come across that can help a volunteer manager of any sized organization. Note: Wild Apricot is an all-in-one nonprofit management option used by over 20,000 organizations (here’s a link to our free, 30-day trial). 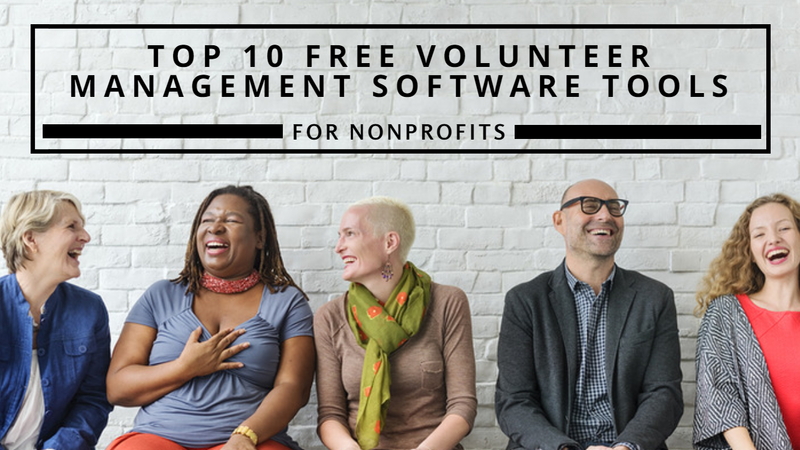 In this list you’ll find the top ten free volunteer management tools, plus five of the best (and cheapest) volunteer management softwares, three free shift scheduling tools, and six more free resources that are incredibly useful. Ivolunteer.com is an easy, effective way to sign up volunteers for events and to manage volunteer scheduling. Just publish your event through email or on your website and Ivolunteer.com will take care of the rest. Features include reusable sign-up sheets, automated emails, and advanced reporting. Premium accounts start at $20/month. RosterVolunteers is a basic volunteer registering software that can be accessed by members, leaders, administrators, and supervisors. Functions include a schedule view with 1-click confirmation (for volunteers) and 1-click mass reminder email (for supervisors only), as well as several features to easily create on-the-fly mass emails based on member qualifications/duties. Samaritan will help you recruit, manage, and measure your volunteers. Features include automated emails, embeddable registration forms on your website, surveys, and full analytics to track volunteer hours. Premium accounts start at $2,500/year. SignUp makes it easy to create a volunteer group and begin coordinating them right away. Features include unlimited emails, customized signup themes, reminders, shift scheduling, and unlimited signups. Formerly VolunteerSpot.com. Premium accounts start at $9.99/month. Signup Zone makes it easy to create a signup form and allows volunteers to see what time slots need to be filled. Add an overview page of your event for $10/year, and a custom URL for a one-time fee of $10. Sons of Service (SOS) is a 100% free volunteer management database for any type of nonprofit. Track any volunteer information including contact info, availability, relationships, and comments. Please note that SOS has not been actively developed since 2011, so it may be limited versus more modern systems. If you require new functionality, you can modify the software yourself, or you may contact Andrew Ziem (the creator) and discuss rates with him. Track It Forward allows volunteers to sign up and begin tracking their own hours. Features include embeddable registration of your website, instant reports, and a mobile app for volunteers to log their hours. Free 30 day trial. Premium accounts start at $15/month. VolunteerLocal includes everything you need to manage an effective and happy volunteer force for events. Features include your event listed on HappyVolunteering.com, your own sign-up website with a custom URL, automated follow-up emails, and online check-ins. Premium accounts start at $200/event. WhenToHelp makes volunteer scheduling easy with automatically assigned schedules based on your volunteers work time preferences. Features include an unlimited number of schedulers, scheduled email reminders, and text message alerts. Premium accounts start at $15/month. YourVolunteers is a powerful, cloud based volunteer management system used by over 10,000 organizations around the world. Features include a public calendar on your website, shift tracking, list filtering, and a volunteer database. Premium accounts start at $20/month. I thought I’d give a worthy mention to some of the best cheap volunteer management tools that have come under my radar. While many of the free tools I mentioned also offered paid features, below is a list of my top five paid-only volunteer scheduling software tools. Volgistics provides a complete volunteer management software. Features include a volunteer portal, automated scheduled reminders, report customization and free support. Over 5.5 million volunteers tracked. Volunteer Impact is a volunteer database and management software for any sized organization. Features include unlimited administrators, a half hour consultation, a volunteer time clock, and an online volunteer portal. VolunteerMark is a robust volunteer management solution which can scale according to the size of your organization. Features include a volunteer dashboard, email and text communication, analytics, and online donations. As its name suggests, Volunteer Schedule Pro is a solution to schedule, manage, and communicate with your volunteers. Features include flexible scheduling, automatic reminders, online substitutions, reporting, and tiered access. vroom makes it easy to create customizable online forms to start signing up volunteers right away. Features include unlimited volunteer sign ups and shifts, unlimited coordinators, volunteer profiles, and communication through personalized messages. While doing research for this article, I also came across a number of free volunteer scheduling software tools. While not optimized specifically for volunteers, I found many similar features that can be beneficial to volunteer managers, especially if you also have paid staff. ABC Roster lets you manage days off, leaves, events, bookings and more. Features include a simple interface, an automated planner, Excel, PDF, or HTML report exports, and scheduled emails. 100% free. ScheduleHead’s free mobile app can be setup for your organization in under a minute. It allows you to automatically send emails to up to 10 employees and sign them up for shifts based on their skills and seniority. Premium accounts start at $19/month. Sling allows you to quickly create shifts, tasks, messages and a newsfeed in an easy to use drag-and-drop schedule builder. 100% free. Volunteer Recruitment Checklist: a useful resource for any volunteer manager looking to seamlessly recruit new volunteers. Free Volunteer Schedule Templates: Sometimes you just need a simple time sheet or task list instead of a sophisticated volunteer management system. If that’s the case, here are 15+ free volunteer scheduling templates. Doodle: Doodle is great if you’re looking to setup a training meeting with your volunteers and you’ve got a flexible schedule. Simply create an event for free and email the link to your volunteers, who can choose the best time that works for them. New Volunteer Application Template: Don’t have time designing a new volunteer application form from scratch? Use one of these 15+ free templates. Microsoft Word compatible. Volunteer Appreciation Certificate Templates: Add an extra touch to your volunteer appreciation by giving your volunteers an appreciation certificate. These 16 templates are Microsoft Word compatible. Volunteer Name Tag Templates: Tired of writing out name tags by hand? Download this simple, printable Microsoft Word template. Thanks for including Church Director in your list! If you are looking for a smarter way to fill shifts and a software that can create intelligent schedules based on preference, I invite you to take a look at Volunteer Scheduler Pro. VSP allows you to fill shifts with ease, reduce administrative costs, and build lasting relationships with volunteers. You can download a free 30-day trial to evaluate the software and see how it will work for your situation. Thanks for including VolunteerSpot on your list. Please come to our website and take a live or video tour. If you can shop online, you and your volunteers can use VolunteerSpot's free and oh-so-easy volunteer scheduler! This is an incredible list. Another option for volunteer scheduling is Hello Scheduling.com. Unlike other scheduling tools on the web, we actually make this tedious process fun. Your volunteers will never miss an event with Hello Scheduling and we offer super deep discounts for nonprofits.